The Answer Key contains all of the answers to the "spotlighted" concepts in the Theory Book. Having students work with various concepts in several different ways assists them with the retention of this important information and enables them to build on a solid foundation. 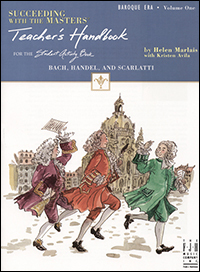 This Student Activity Book is full of enjoyable activities that will help your students learn about the master composers of the Baroque Era. The stories, games, puzzles, and activities for listening, drawing, and writing are an easy way to engage students in an understanding not only of important information about the composers' lives, but also of their music. Students will be able to complete the activities by referring to the Succeeding with the Masters® Baroque Era, Volume One Performance Book. 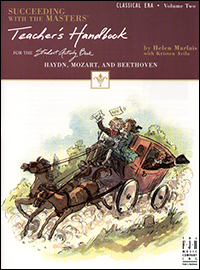 The Teacher's Handbook contains all of the answers for the Student Activity Books, as well as some additional ideas for group activities and a recommended general music listening list for the young piano student. 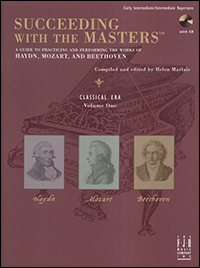 Succeeding with the Masters® is a collection of 26 graded repertoire pieces by Haydn, Mozart, and Beethoven. 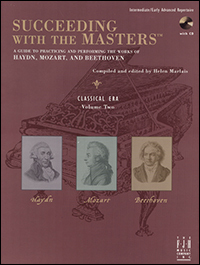 It provides a complete overview of the musical characteristics of the Classical Era in an easily comprehensible manner. Students learn practice strategies, musical concepts, and general characteristics of the era as they explore delightful pieces by the great composers. Aompanion recordings of complete performances and practice strategies are provided. 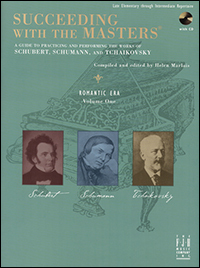 Succeeding with the Masters®, Romantic Era, Volume One, is a collection of graded repertoire featuring selections from Tchaikovsky, Schumann, and Schubert-three great masters of the Romantic era. These works build a foundation for playing the more advanced repertoire of the Romantic era. Each piece is introduced by a short "discovery" of a particular characteristic of the Romantic era. Practice strategies guide the student in preparing and performing each piece. This comprehensive approach to learning style, technique, and historical context provides a valuable foundation for successful performance of all romantic repertoire pieces. 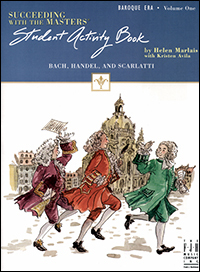 The Student Activity Books are fun-filled educational companions to the Succeeding with the Masters® repertoire collections - an ideal way for your students to explore the world of the master composers. 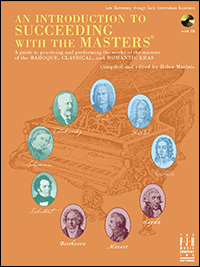 This Student Activity Book is full of enjoyable activities that will help your students learn about the master composers of the Classical Era. The stories, games, puzzles, and activities for listening, drawing, and writing are a time-effective way to engage students in the lives and music of the great composers. A supplementary Teacher's Handbook provides the answers to the student activitities as well as some additional ideas for group activities. This Student Activity Book is intended for use with the Succeeding with the Masters ®, Classical Era, Volume One Performance Book. The Succeeding with the Masters ®, Teacher's Handbook Classical Era, Volume One provides the answers to all of the games, maps, puzzles, stories, and listening activities that appear in the corresponding Student Activity Book. Also, some additional ideas and suggestions for group activities are given. You will be delighted when you see the variety of fun and interesting information provided in this book. 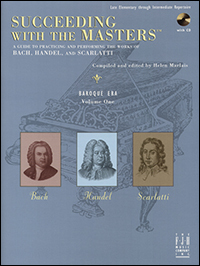 Baroque Era, Volume Two of Succeeding with the Masters® continues the collection of graded repertoire, featuring the great masters of the Baroque era. 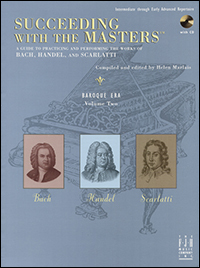 These 25 marvelous selections build a foundation for playing even more advanced baroque music, such as the two-part inventions by Bach, Handel suites, and the more difficult Scarlatti sonatas. Complete and easily comprehensible overviews of the era's musical characteristics appear throughout, along with biographies and practice strategies. This cumulative approach to learning style, technique and historical context provides a valuable foundation for successful performance. Companion recordings of complete performances and a practice strategy workshop are provided. 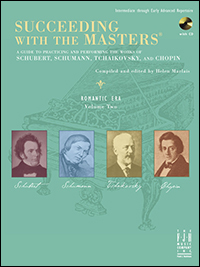 Within Succeeding with the Masters® Romantic Era, Volume Two, comes the intermediate through early-advanced pieces by Schubert, Schumann, Tchaikovsky, and Chopin. As with all of the books in Succeeding with the Masters®, Dr. Marlais presents each work within the context of its social and historical time. Valuable practice strategies for each piece help teachers guide their students in developing the correct technique and musical style. Just listen to your students take off when they realize that they can play pieces by the greatest composers who have ever lived. Students want to succeed, and when they succeed with the masters they know that they have done something special. There is no better motivator! 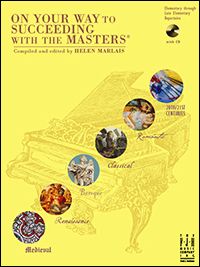 The Succeeding with the Masters® Student Activity Book Classical Era, Volume Two is full of enjoyable activities that correlate with the Classical Era Volume Two Performance Book. These activities will help your students learn more in-depth facts and interesting information about the master composers of the Classical Era. The stories, games, puzzles, and activities for listening, drawing, and writing are an easy way to engage students in an understanding not only of important information about the composers' lives, but also of their music. A supplementary Teacher's Handbook provides the answers to the student activities, as well as some additional ideas for group activities. The Succeeding with the Masters® Teacher's Handbook Classical Era, Volume Two provides the answers to all of the games, maps, puzzles, stories, and listening activities that appear in the corresponding Student Activity Book. Also, some additional ideas and suggestions for group activities are given, as well as a recommended listening list. The variety of fun and interesting information provided in this book is sure to please!